Joining the amazing Nerf collection of soft play toy guns is the fantastic looking Nerf Zombie Strike Slingfire Blaster. Featuring a fast charging lever action loading mechanism, this blaster can propel the six supplied Strike Darts up to 75 feet to hit the enemy targets. Built for kids of 8 years old and over, this blaster joins an ever growing selection of innovative Nerf products that feature new designs and more fire power than ever before. 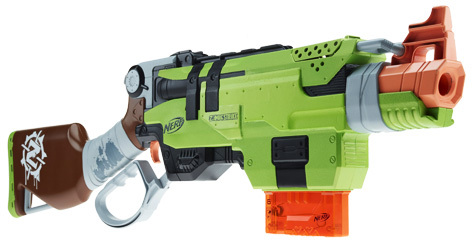 Please tell us what you think of the Nerf Zombie Strike Slingfire Blaster by NERF.